“DAVIES ICE BLAST” is a safe, quick-acting ice melting compound. “DAVIES ICE BLAST” represents the standard for snow and ice removal. “DAVIES ICE BLAST” dissolves ice rapidly even at subzero temperatures and is much more efficient than regular rock salt. “DAVIES ICE BLAST” keeps melting where ordinary rock salt stops. Where rock salts lowest effective temperature is around 20° F, “DAVIES ICE BLAST” melts through the thickest ice at temperatures lower than -20°F. You end up using less “DAVIES ICE BLAST” to melt ice, therefore eliminating unsightly tracking on floors and carpets. 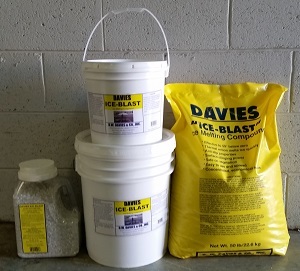 “DAVIES ICE BLAST” is not corrosive to concrete or asphalt, does not kill plants and when properly used, does not track objectionably into buildings. “DAVIES ICE BLAST” is by far a much better value in efficiency and safety than rock salt.